Mona Lisa Smile is a movie about feminism starring one of the biggest women actors and three of the better younger women actors in Hollywood. And, it is written and directed by three men. Is this a problem? Not really. The movie is just as preachy and dull if it were written by preachy and dull women. 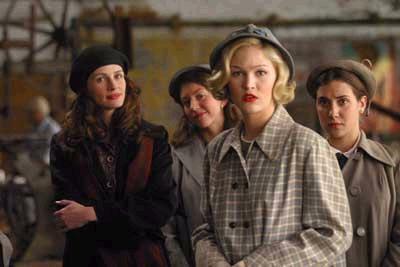 Mona Lisa Smile takes place in 1953 Wellesley College, where new Art History teacher Ann Willis (Roberts, Confessions of a Dangerous Mind, Full Frontal) comes hoping to change the world. Willis is a Berkeley grad, awash in the burgeoning theories of feminism. Women can and should be able to do whatever they want. They do not have to be housewives. They are perfectly capable of being lawyers, teachers, or whatever the heck they want to be. She chose Wellesley because they have the best and brightest female students who have the capability of becoming next generation's leaders. What she does not count on is that Wellesley is fiercely conservative, and her ideas clash with the endemic, old-fashioned values cherished there. In her words, Wellesley is a fancy "finishing school," training its women to be good wives. This story sounds very familiar, and it is. Willis is a headstrong teacher who wants to change the way the world operates. She is unconventional, butts heads with the faculty, and builds a strong base of admiration within the student body. Joan (Julia Stiles, A Guy Thing, The Bourne Identity) is pre-law, but plans on getting married after, forsaking a career for family. Willis encourages her to apply for law school, something that Joan did not even consider. Giselle (Maggie Gyllenhaal, Casa de los Babys, Confessions of a Dangerous Mind) is a free spirit like Willis, and instantly takes a liking to her. This contrasts with Betty (Kirsten Dunst, Levity, Spider-Man), who instantly dislikes her. Betty epitomizes the conservative values of the college. She likes the status quo, and will viciously editorialize against anybody who feels otherwise. Betty marries into the semester, and then becomes lazy in her classes, bringing forth Willis' ire. Willis wants to teach her students about modern art, which angers the faculty, and only increases her resolve to do so. Bill Dunbar (Dominic West, Chicago, Rock Star), Italian teacher and eventual love interest, encourages her to work within the system, but Willis doesn't listen. Director Mike Newell (Pushing Tin, Donnie Brasco) wants this to be an inspirational weepy, but that's hard to do when the film is bereft of any genuine emotion. Everybody is just going through the motions, doing what screenwriters Lawrence Konner and Mark Rosenthal (Planet of the Apes, Mighty Joe Young) require them to do. They do have somewhat of a difficult job to do. It's important to remember that although this takes place in the recent past (fifty years ago), views on a woman's place were extremely different. Somehow, Konner and Rosenthal need to have people relate to the ideas that most of the characters in the film believe in. They do fairly well with the students. On the whole, they are a believable bunch. They are smart women, limited by the era in which they grew up. Willis is opening their eyes, and most of them end up for the better. Still, they way in which this happens is predictable. Joan is the character with the most depth. She struggles with what she wants versus what is expected of her. This is not the case with Willis. As a character, she is meant to be progressive, but here she is too much. Instead of being Ann Willis, Roberts feels like she's playing Julia Roberts. She's a little too modern for Mona Lisa Smile, if that's possible. Worse, she is guilty of obstinacy, one of the things she faults Wellesley with. Feminism means that women have the right to choose. They can be lawyers if they want. They can be housewives if they want. It is their choice, not somebody else's. Willis believes that being a housewife is demeaning. If somebody disagrees, then that person is wrong. Two characters even call her out on this, and the script then brushes it aside. Newell is not subtle with Willis' message. He constantly reminds the viewer as to what Willis believes in to the point where the film begins to get preachy, which is absolutely not a good thin. It finally ends exactly the way one would expect, with the typical things happening to each of the characters. Too bad it is hollow at its core, so that each of their resolutions registers very little emotion. 2 hours, 5 minutes, Rated PG-13 for sexual content and thematic issues.